Pectus excavatum, or sunken chest, is a condition that is usually present at birth, but it can become more pronounced in adolescence, causing a decreased exercise tolerance, respiratory infections, chest pain and heart murmurs. However, most cases are fairly mild, and weight training is not likely to cause further complications. Combining muscle building exercises for your chest with corrective exercises for your condition can improve both the appearance and function of your chest and rib cage. Train your chest twice per week on non-consecutive days. To maximize muscle growth, the American College of Sports Medicine recommends you select weights for each exercise based on 70 to 85 percent of your one repetition max, or 1RM, which is the most weight your can lift once with good form. As a beginner, perform one to three sets of eight to 12 repetitions. As you become stronger, advance to three to six sets of one to 12 repetitions. Start your workout with a bench press. Place your hands shoulder-width on the bar and have a spotter help you un-rack it. Lower the bar to your chest under control, pause for half a second, then explosively lift it up again. Corrective exercise specialist Mike Robertson recommends drawing your shoulder blades together and keeping your elbows tucked in throughout the movement to avoid shoulder and elbow injuries. Use a weight that is difficult but enables you to complete all your sets with good technique. Superset your exercises. Performing a superset of pushups and dumbbell flys back to back with no rest between is a very effective way to stimulate muscle growth and boost your training capacity. Perform a set of pushups with perfect technique and form, then grab a pair of dumbbells and do a set of flys lying on a weight bench. To make the pushups more challenging, wear a weight vest or raise your feet on boxes. Eat a healthy, well-balanced diet consisting mainly of fresh vegetables and fruits and adequate protein. To promote muscle mass and strength, registered dietician Rob Skinner of the Georgia Tech Athletic Association recommends you consume 1.7 grams of complete protein for every kilogram of body weight, daily. In addition to performing muscle building exercises, HealthGuidance.org recommends you do exercises that focus on improving your posture and realigning your ribcage. To reset your rib cage, use a straight bar placed atop your shoulder blades to do seated trunk rotations. 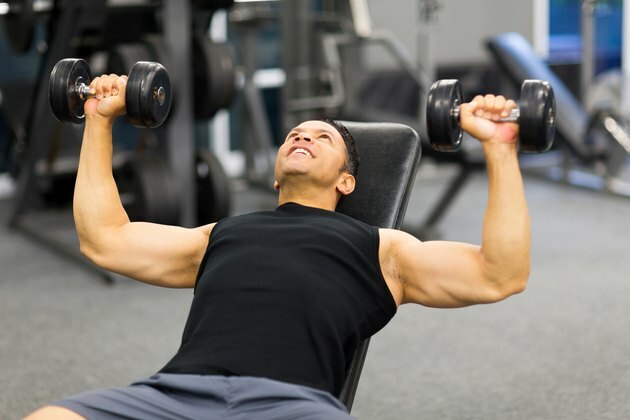 To open up your chest cavity, perform dumbbell pullovers by lying on a bench with extended arms, holding a dumbbell in both hands above your sternum. Inhale and raise the dumbbell over your head so that your rib cage stretches and expands. Exhale and return to your start position.